"As part of the 250th Anniversary of the 'Settlement and Incorporation of the old Town of Redding', a procession through several streets began on Main Street and traveled up Sweetser Street to Pleasant, Park, Main, Yale Avenue, Railroad (North Avenue), Chestnut, Park Avenue, Dell Avenue, Converse, Gould, Albion, Railroad, Chestnut to Main Street where the procession passed in review before Governor Frederic T. Greenhalge. The procession included dignitaries from throughout Massachusetts, followed by four divisions of marchers, barges and wagons. Among the participants were more than 1,000 school children, occupying 30 barges, and local tradesmen and businesspeople. The extensive list of participants does not mention the group pictured. A letter to the editor in the Wakefield Daily Item a few days later mentions the lack of recognition for the Town's Indian heritage. Just 15 years later, Wakefield's Wahpatuck Tribe 54, Improved Order of Red Men received its charter and eventually became the largest tribe of Red Men in the state. The name originated from Chief Wahpatuck, Sachem of the Massachusetts Indians, who was killed in 1669 while on a raid against the Mohawks. With a membership of over 250 in 1944, the Red Men had what members referred to as their wigwam at 33 West Water street." -- Text from calendar by Jayne M. D'Onofrio. 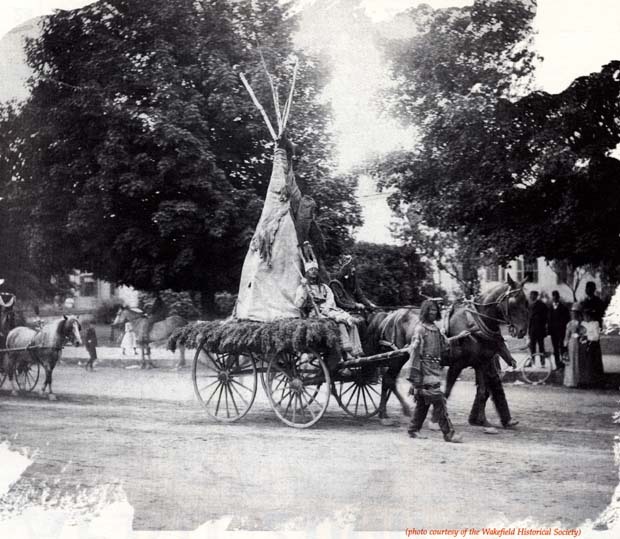 “Settlers' Day procession,” NOBLE Digital Heritage, accessed April 22, 2019, https://digitalheritage.noblenet.org/noble/items/show/7071.